After The Moon that Embraces the Sun, Kim Soo Hyun is secretly recording the OST for the drama day and night, and he is also expected to laungh a new single. After the end of the filming of The Moon that Embraces the Sun, the schedule of Kim Soo Hyun is still packed and busy. On March 9th, 2012, Kim Soo Hyun shot the advertisement for Petitzel in a studio in Seoul’s Sinsa-dong, and then followed by shooting for the Samsung Smart TV CF. After completing the shooting for 2 CFs at midnight hour, he continued with participation in the recording for the 6th OST of The Moon Embracing the Sun. The management agency of Kim Soo Hyun, KeyEast, said, “Kim Soo Hyun did not rest for 3 days prior to his final filming for the TV series on March 8th, 2012. And after the completion of shooting on March 8th, he just slept for 5 hours, and started the CF shooting on March 9th, 2012. The recording work for OST and publicity activities with the media all concentrated in March. On the other hand, Kim Soo Hyun who is becoming ultra popular after appearing in The Moon that Embraces the Sun has clinched the deals for more than 10 CF contract. The advertising revenue is expected to reach 5 billion South Korean wons (about 5 million US dollars). The advertising industry has fall into the “long for Hwon disease,” and the company has said that the CF will keep increasing in future. 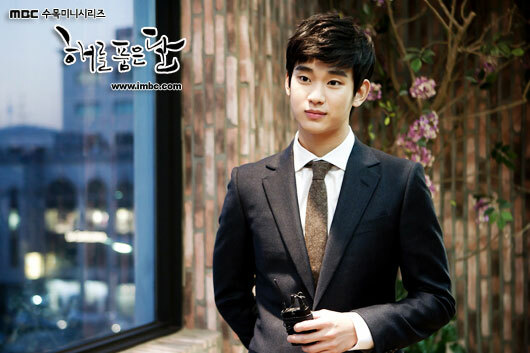 In addition, the new movie of Kim Soo Hyun, The Thieves, is to be released in July 2012.